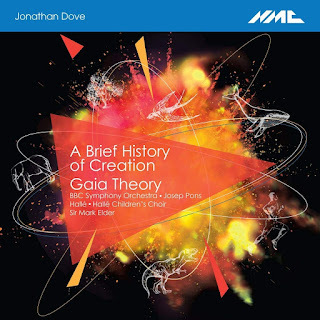 This new disc from NMC brings together two works by Jonathan Dove which depict the Earth and its creation, using quite a scientific point of view yet creating richly vivid works. A Brief History of Creation, with words by Alasdair Middleton, is a sequence of thirteen movements describing creation from the Big Bang onwards, performed in this live recording by the Halle Children's Choir, the Halle, conductor Sir Mark Elder. Gaia Theory is a three movement orchestral work which is performed by the BBC Symphony Orchestra, conductor Josep Pons, again in a live recording. A Brief History of Creation arose from a commission for the Halle Children's Choir, choir director Shirley Court, and Dove drew his initial inspiration from a James Turrell art installation. Alasdair Middleton's texts take us from the creation of the stars, through the elements and selected animals to man. Dove admits that the narrative has gaps, and that they chose things which would be fun to sing about such as dinosaurs, whales, elephants and a shark. The children generally sing a unison line (which towards the end of the work divides) and the writing is certainly not simplistic. Whilst Dove might describe these as songs, they are definitely not children's songs, the vocal lines are extended and Dove surrounds them by extensive orchestral contributions, colourful accompaniments and atmospheric commentaries so that this is as much an orchestral piece as a choral one. It is a substantial work, lasting well over 45 minutes and frankly, at times I found the slightly jokey, characterful style of Middleton's words a bit too much. Also, the essential texture of the piece remains relatively constant, a strong vocal line accompanied by richly imaginative orchestral textures. It is the sheer vividness of Dove's invention, depicting the various things described, which keeps the attention, that and the superb performance from the Halle Children's Choir who sing as if this was the most natural piece in the world, despite the complex concepts, tricky textures and large scale. Overall there is an engaging vividness to this piece, along with a lovely directness from the children which ultimately make it rather striking. The other work is a 20 minute three movement suite, Gaia Theory based on ideas from the work of James Lovelock, of Earth as a self-regulating mechanism. Again it is Dove's sheer invention, and the brilliant way he brings together the ideas and Lovelock's image of everything dancing together into something rather engaging. The opening movement is full of exhuberance, whilst the second is more magical in its textures and the final movement is one of Dove's rhythmic dances which starts from a simple figure and simple grows, and grows and grows. Both works are recorded live, yet neither feels like a live recording as the performances are so confident and so full of character. The vitality and energy which the children give off, in particular, is one which cannot be counterfeited and comes from the sheer joy of performing live. There is something vital and optimistic about these pieces. Not everyone will enjoy them, they are full of Jonathan Dove's familiar style and orchestral textures, his way of writing which combines rhythmic drive and melodic facility. But I felt that they couldn't help but put a smile on your face.